Sky & Telescope is a magazine covering all astronomical topics. It is an American magazine published every month. The magazine was founded by Charles A Federer and his wife Helen Spence Federer in November 1941. 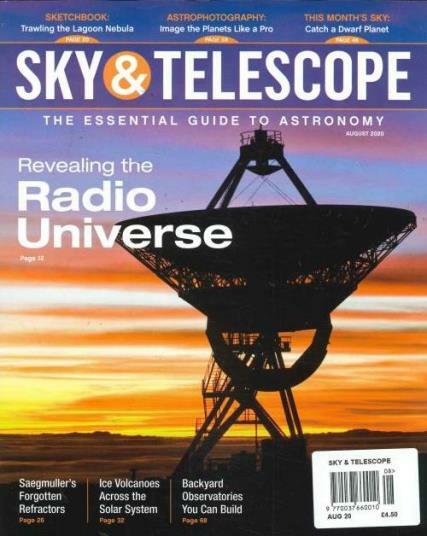 Sky & Telescope was formed by the merger of two separate magazines The Sky and The Telescope. From 1933 to 1990, magazine had a special column, “Gleanings for ATMs" through which it spread the knowledge of telescope making. This magazine is an essential if you are astronomy lover. The magazine is running successfully from last 70 years and has become the complete and reliable resource for astronomy enthusiasts to become great observers. Magazine is a favorite among people who have interest in celestial objects because it covers all aspects of astronomy. It also covers amateur astronomy like all current events occurred in astronomy, give information on space exploration, any special events occurred in the amateur astronomy community, covers latest products, provide information reviews, covers reviews on astronomical equipment, books, and computer software, covers stimulating articles, covers amateur telescope making and fascinating astrophotography also. Magazine covers lots of information about science and is a compendium of information for hobby astronomers. It is a colorful magazine with beautiful and mesmerizing professional photography of celestial sights. Magazine also gives due consideration to the amateur photography of celestial sights. It tries to simplify the complex information by preparing tables and charts for all the upcoming events which might be the interest of the lay man.